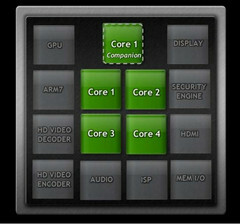 When Nvidia announced its next generation Kal-El mobile processor back in February at the Mobile World Conference, it was revealed to be a quad-core processor and the likely successor to the current dual-core Tegra 2 chips that currently power a number of tablets and high-end smartphones. What Nvidia didn’t tell us is that there will actually be a fifth core as part of the Kal-El SoC. The extra core does its duty when the device is idle or otherwise not stressed so the other four cores can power down to a lower-energy state. In essence, the Companion core was made with energy efficiency in mind for maximizing precious battery life. 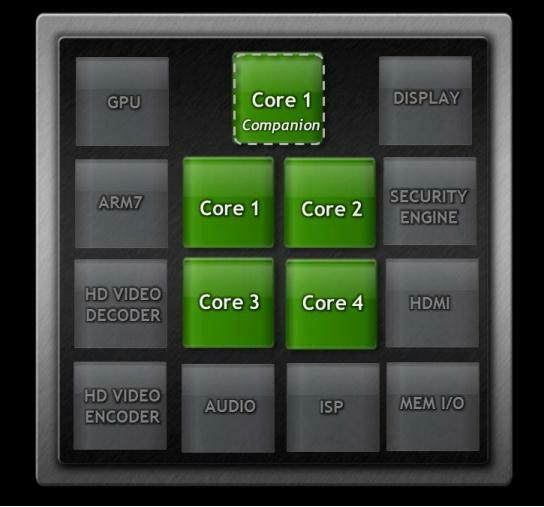 The Nvidia Kal-El APU, likely to be marketed as Tegra 3 upon release, is expected to be available for tablets before the end of the year. Smartphones sporting the quad-core chip will have to wait until at least early 2012. By then, other major mobile chipmakers may have their respective next generation chips ready as well, such as Qualcomm’s quad-core Snapdragon APQ8064 or Texas Instrument’s OMAP 5 series. 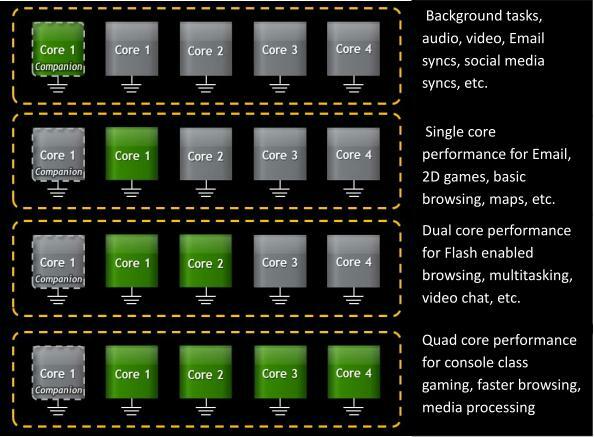 Additional power-saving features of Kal-El compared to current competitors are detailed in the Nvidia source below.